Whether or not the results of a computer simulation are credible depends to a large extent on the credibility (or lack thereof) of the underlying conceptual model. If a model has been developed explicitly with the goal of running a computer simulation in mind, the two types of credibility may seem deeply intertwined. Yet, often enough, conceptual models predate the subsequent development of simulation techniques, or were first developed outside the context of computer simulation. 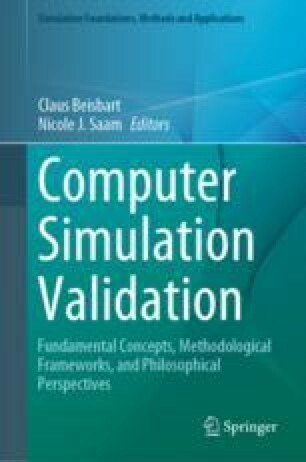 In such a situation, the specific contribution that a conceptual model makes to the credibility of a simulation requires considerable analysis. How, then, should we assess the credibility of a conceptual model, and which factors ought to play a role in judging whether simulation results derived on its basis are trustworthy? In order to answer these questions, the present chapter begins with the premise that models are never by themselves credible simpliciter, but acquire credibility within a given context of inquiry, which itself depends on the cognitive interests of the inquirer. Judgments concerning the credibility of a conceptual model thus need to be based partly on a characterization of the intrinsic features of the model, partly on the cognitive goals and interests of its users. This realization helps explain why credible models have been variously understood as (pragmatically and empirically) adequate representations of real-world target systems, as constructions of “credible worlds” that display internal coherence, and as exploratory tools that may aid our understanding even before a well-developed underlying theory takes shape.